1. Eat healthier. I'd like to eat more salads, fruits, veggies, and chicken over the summer. I'll be (attempting to) limit my fast food and fattier meals in exchange for healthier ones. Wish me luck, because I'm going to need it! I'm hoping with some willpower and routine, it will become easier. It's not like I eat our every day, but I do love me some Cheetoh Puffs, Doritos, pizza, and cheeseburgers, and when the craving calls, I usually answer :-/ I am writing this post as I eat a salad for lunch, which I packed up this morning before leaving for work. It took some time to gather it all together, so I'm quite proud of myself for getting it done haha. Not to say that I'm giving up everything that's unhealthy, just trying to limit the amount I eat. 2. Start Doepy training. Ahh! Can't believe July 1 will be the beginning of training for the Dopey Challenge. Scary, though the heavy mileage doesn't come until September, where it starts hitting 13+ miles, and the inclusion of a week with 4 days of running instead of 3 (there are 6 of them total, I believe). I'm following the Jeff Galloway plan up on the runDisney training page, as I also use his run/walk method. I figure it'll give me my best shot in finishing all of the races. Note that I am not concerned with my time for any of the races, just that it's within the time limits. 3. Start cross training on a regular basis. I'd love to get into swimming, but I have yet to find a gym or location that's close enough to home or work and is a reasonable price. Other than swimming, I'd like to start riding a bike, and try some other forms of cross training to see what I enjoy most. 5. Spend time outdoors (with plenty of sunscreen and hats, of course). Whether it be reading (I want to do a lot of reading! ), walking the dogs (as long as it isn't too hot for them), picnics in the park, hanging out with friends at their pools – I want to be outdoors enjoying the fresh air, instead of being cooped up inside being lazy and unproductive on the couch. I'm really hoping for a fairly mild summer, so that I can stand being outside long enough to enjoy it! I'm not a fan of 90+ degrees (or 80s, if I'm being honest with you, don't hate me). • finish getting the office organized, cleaned, and have it stay that way. • go through clothes and donate things no longer worn. • organize my closet and dresser drawers. • spend time with my family. Thanks to Courtney, Cynthia, and Mar for hosting! 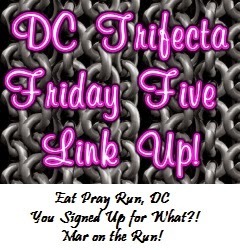 Make sure to check out their "Friday Five" posts and link up if you are joining in! There are always a lot of blogs linked up, and it's interesting to see everyone's takes on the theme. I suggest taking a look at a few (or all, if you have the time). Have a great weekend, everyone! Summer training...always a challenge but worth it! Running the Dopey challenge must be so exciting!! I find the general nice weather to motivate me to get moving (though the summer heat can be a real doozy). I'm both excited and petrified for Dopey! Haha. Ahh Dopey Training. I remember printing out the Galloway plan last summer and the start to training. It seemed so far away. You will do awesome if you follow Jeff's plan. We (daughter and I) had so much fun doing the Dopey Challenge. Send us an email if you have any specific questions. Also enjoy your time outdoors and all the cross training/strength training. It will help alot for the race weekend in January! Thanks, Pam! I'm excited and nervous about it. I appreciate your support, and will most likely be emailing you some questions! I'll be Dopey training right along with you! (Though I have another marathon right in the middle of it so I'm kind of focusing on that first. Holy moly I'm going to be running a lot.) We definitely need to keep up with each other and see how it's going! Yay! Someone to commiserate with ;) I'll definitely need other people to help push and motive me when the going gets tough! My husband is great, but having other people in the same boat (aka Dopey people) to talk with will be a wonderful help! If I don't sign up for a marathon this fall, the one at the end of Dopey will be my first. Is that super... well, Dopey, or will I survive if I follow the training? I'm not so sure haha. Thank you! Yeah, it's a very long program. I know some people won't use the same training plan and start later, but I figure following this particular plan is in my best interests. Plus it really eases you in (I might change the first few weeks up a bit, since the long runs are pretty standard lengths for me already. Nothing too crazy, as I don't want to burn out, but maybe a few extra miles here and there. We'll see.) Do you have a marathon coming up? Yeah, I think it would be best if I hop on that train! Any certain moves or workouts you enjoy? The sunshine definitely puts me in a good mood and helps to get me out of bed in the morning for the AM runs! This is a great plan! Yes, cross train as much as you can! And it's good you're starting Dopey training now! I did the Dopey last year and it took half the year to prepare...then it was all over in a flash. Remember that it will come sooner than you think when you're in the middle of months out training! Thanks! I know, these things we train and are so excited for come and go so quickly! nice healthy and fit summer planned! good luck with Dopey training! I can't even imagine :) thanks for linking up with us. Thank you! I can barely imagine it haha. yes on cross training! i'm going to figure out how i can keep working pure barre into my budget. i LOVE it but it's SO expensive!